The best room in the hotel. This large double room features a stained glass window, a large bed and a double sofa bed, as well as a small dining area. In the room: Underfloor heating, air conditioning, refrigerator, satellite TV, telephone, Minibar, safe for valuables. Free toiletries, hairdryer, slippers, bathrobes. This large double room features stained glass windows, a large bed and a double sofa bed. In the room: Underfloor heating, air conditioning, refrigerator, satellite TV, telephone, Minibar, safe for valuables. Free toiletries, Hairdryer, Slippers, bathrobes. Some of the rooms in this category also have a balcony. Standard double room with large bed and extra space. 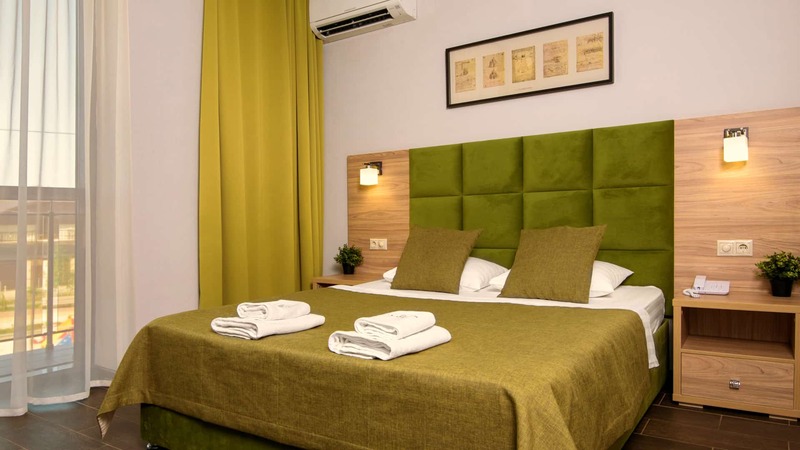 The room has Underfloor heating, air conditioning, fridge, TV with satellite channels, telephone with connection to the administrator, minibar. The room has a private bathroom with shower and hairdryer, toiletries. Standard double room with 2 single beds. In the room: Underfloor heating, air conditioning, refrigerator, satellite TV, telephone with administrator, mini-bar, safe for valuables. The room has a private bathroom with shower and hairdryer, toiletries. 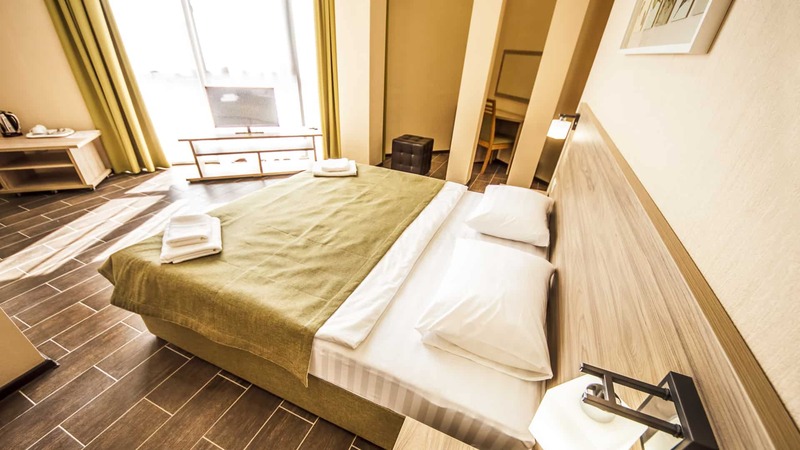 Triple room with 3 single beds or 1 double and 1 single bed. In the room: underfloor heating, air conditioning, refrigerator, satellite TV, telephone for communication with the administrator, city and mobile calls, mini-bar, safe for valuables. The room has its own bathroom with shower, toiletries. Some of the rooms in this category also have a balcony. Room category can accommodate up to 3 persons with limited equipment. Room amenities: double bed, telephone, Desk and chair, wardrobe, bedside table. In the bathroom: shower, toilet, sink, cosmetic mirror. Free high-speed Internet, drinking water (cooler on the floor).